A masterplan is a long-term planning document that articulates a guide for future growth and development. It takes into consideration the surrounding area, specifically social settings, buildings and surrounding environments. A good masterplan should reward the home owner at every stage of their ownership and as their property and the surrounding area develops. Third Avenue’s masterplan is designed to embrace its unique position in Everard Park, nestled within the green surrounds of established tree-lined streets and the adjacent Brownhill Creek. Each element of the design has been CONSIDERED to ensure each home has abundant – light, space, visual access to green spaces, while still providing privacy from neighbours. The masterplan was not designed to maximise production, but to maximise the VALUE of each home. The design RESPONDS to its environment, as opposed to just inserting itself into it. The concept involves creating space that sits within the Everard Park neighbourhood but creates its own community inside its boundary. Green spaces have been created to ‘follow’ residents around each corner – through a tree-lined and landscaped entrance, turn left and pick up the green spaces of the central pocket park, then look straight towards a landscaped park opening onto the walking trail along Brownhill Creek of Wilberforce Walk. The streetscape internally has been designed to transition pedestrians and cars seamlessly, blending materials to calm traffic and allow residents to actively walk around the development yet provide ample car parking. 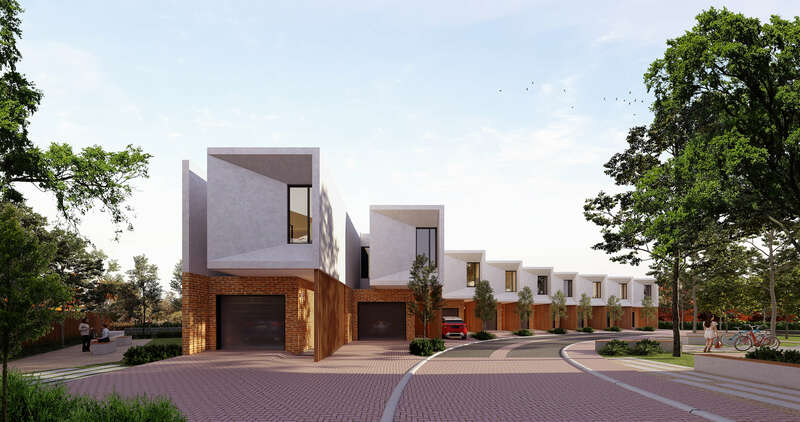 The masterplan was designed to offer a range of residences aimed at different home owners in different stages of life and the architecture of each residence style shares materiality yet creates uniqueness for each home. Throughout the plan, it was a core focus to create unique individual residences expressed through layout and design, rather than properties that were exactly alike.